We love our grilled veggies. We also love our stuffed peppers. This easy recipe brings the two together over a hot grill for a colorful and unique way to serve a hearty meat and veggie Paleo meal. If you’re familiar with traditional stuffed peppers, you know they’re usually cut in half, filled with meat and sauce, and then baked in the oven. This recipe is a little different. You pre-cook the meat and sauce in a skillet on the stove like normal. But instead of slicing the peppers lengthwise, you cut around the tops, pour the meat and sauce inside, put the tops back on, tie them down with twine, and grill them for about 20 minutes. 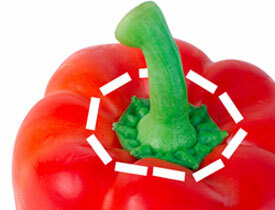 Cut pepper tops close to the stalk at an angle toward the center – the top you remove will look like a plug. What you want to do is carefully cut around the top close to the stalk at a downward angle toward the pepper’s stem (sort of like you were cutting the top of a pumpkin to make a jack-o-lantern). Next give the stuffed peppers a nice coat of olive oil, and place lengthwise on a medium-hot BBQ grill. Obviously you want to avoid direct flames so the string doesn’t burn through. Turn the peppers frequently until you get a nice char. Total grilling time can be anywhere from 10 to 20 minutes – maybe a little longer if they’re wrapped in foil. Just keep an eye on them. So how do you make the good stuff inside? Try our quick and easy Paleo ground turkey filling below, or use your own favorite recipe. That wraps up this hot little recipe. Give it a try and let us know what you think! Remove the top. It should look like a little plug. Clean out pepper seeds and remove membranes if desired with a knife from the hole in the top. Keep each top paired with the pepper it came from for the grilling step. Secure each pepper from top to bottom with at least a double wrapping of string, tying the ends firmly around the stalk to hold the top in place. Grill over medium heat 10 to 20 minutes, turning frequently until achieving desired char. 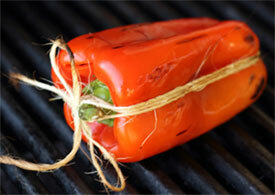 Remove from grill, snip the strings, discard the tops, slice the peppers with the filling, and enjoy! It does! Haha! I didn’t notice that before! That looks like a little ladybug! And it sounds delish! !